As I am nearing the end of my treatments (This coming Wednesday is my last one - yay! ), I am so glad to see an end in sight! These past few treatments have been rough on me, both physically and emotionally. Physically - I have become so much weaker with fatigue and swelling all over my body, the palms of my hands are riddled with neuropathy, and my arm port is still uncomfortable. Emotionally - I have shed tears for unknown reasons. There are days when I am so overwhelmed with various thoughts, feelings and emotions that I don't know how to explain what I'm feeling to anyone, or to even know where to begin with a prayer. A couple of weeks ago, the Lord knew I needed some encouragement, and that's when my dad e-mailed an old Dallas Holm song called, "Here We Are." Unknowingly to him at the time, the words spoke to me because, during those times when I don't have any words to say, I can at least sit quietly in the Lord's presence and KNOW He is there to help me through these difficult times. God understands my heart, and I know the Holy Spirit is present within to lovingly intercede for me when needed. I don't have to "worry" about finding the right words to say. Instead, I can just praise the Lord for all He has done for me, and for all He has brought me and my family through thus far. Oh My Friend...this is awesome! You come from quite amazing 'stock' as well. I love Dallas Holms...went to his concerts whenever he was in Indy. We saw and talked to he and his wife a few yrs. ago. He had a concert at a friends church. Amazing folks, who are quite humble and still going on. 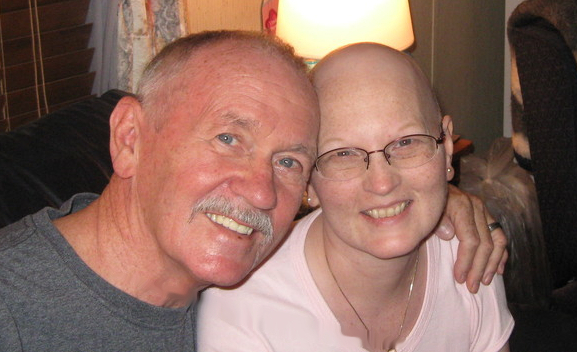 She had cancer too and recovered doing even more for the Kingdom. This song...absolutely love it and sing it at our church. Very 'rich'. Lord bless! Thanks for sharing all of this with us. That was so special. You have no idea how it touched my heart.